2017 Veterans scholarship recipients from the University of South Florida. 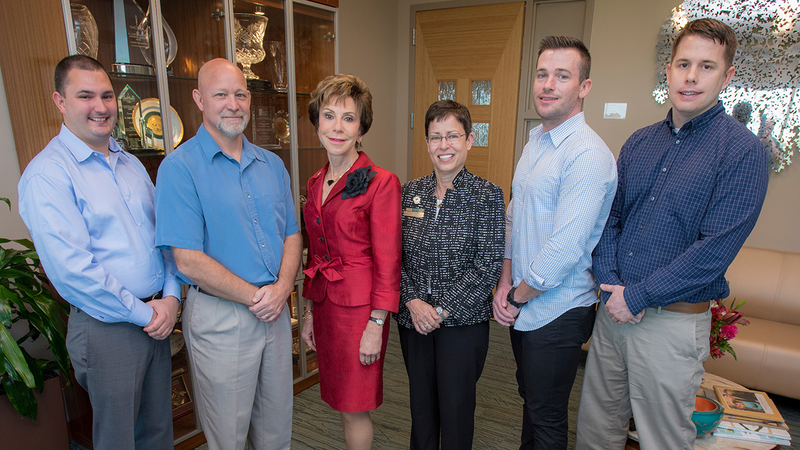 Left to Right: Larry Eichel, Brian Busch, Dr. Judy Genshaft (USF System President ), Dr. Karen Berkman (Berkman Foundation board member), Michael Simmons, and Joshua Pericles. Given the particular interest in supporting the education of U.S. Veterans, the Foundation seeks to award scholarships to U.S. Veterans and especially seeks students holding a Combat Infantrymen’s Badge, suffered a serious injury due to combat action (such as a missing limb), received a Purple Heart, served or continue to serve with honor and distinction, or were honorably discharged from military service. The veteran scholarship is open to all majors and areas of study.